This article deals with what might commonly be called "mind reading." More specifically and technically it deals with methods by which the thoughts a person is thinking can be inferred by analyzing physiological data obtained about that person from any sort of sensor devices. (This inference need not be 100% effective to be a powerful technique for information gathering from, and harassment of, a targeted individual. Even a remote heartbeat and breathing monitor, combined with surveillance cameras, would allow for thought inferences that would be extremely unnerving to a targeted person.) Combining such capabilities with techniques and technologies described on other pages of this site would allow for a "full-duplex" sort of mind manipulation. This article at the DOE Openness site deals with the remote measurement of physiological data using microwave techniques. It is titled "Measurement of Heart and Breathing Signals of Human Subjects Through Barriers With Microwave Life-Detection Systems." This 1981 Science Digest article by Gary Selden, "Machines That Read Minds" provides a good introduction to brainwave analysis as a means for thought inference. It describes some of the research being conducted at that time, and notes that the CIA actively funded such research. A technique described as brain fingerprinting has been developed to determine if a subject recognizes some aspect of a scene, etc. It is being marketed as a tool for law enforcement, like a brainwave version of a lie detector. It uses a technique like that described for the P300 "recognition wave" in the Gary Selden article above. This is a PubMed abstract of an article "Brain-wave recognition of words." See also the Related Articles. The full text of recent articles in the Proceedings of the National Academy of Sciences can be accessed online. Here is a brief excerpt from an article titled "Thought Control," by Peter Thomas, in New Scientist, March 9, 1996: - Last year, at the University of Tottori, near Osaka in Japan, a team of computer scientists lead by Michio Inoue took this idea further by analysing the EEG signals that correspond to a subject concentrating on a specific word... The system depends on a database of EEG patterns taken from a subject concentrating on known words. To work out what the subject is thinking, the computer attempts to match their EEG signals with the patterns in the database. For the moment the computer has a vocabulary of only five words and takes 25 seconds to make its guess. In tests, Inoue claims a success rate of 80 percent, but he is working on improvements... Note that the time to "guess" is not really meaningful by itself (depending on the computer and algorithm used) and that significant improvements to both the signal measurements and the pattern matching algorithm are almost surely possible. Scientists from the Department of Molecular and Cell Biology at the University of California, Berkeley, have successfully wired a cat's visual system so that they are able to reconstruct computer images of what the cat sees. They attached electrodes to 177 cells in the thalamus region of the cat's brain. Here is a BBC article, on the research, and these are images of the reconstructed views. (Here is a local copy of the images page.) This page at the C.A.H.R.A. site includes an L.A. Times article from 1976 about research into inferring thoughts and remotely measuring magnetoencephalograph (MEG) data. One source of information about a person's thought process is where the eyes focus. Eye gaze monitoring devices are currently being marketed for the disabled and for applications like studying the effectiveness of advertising. One such system, originally developed at the University of Virginia, is called ERICA. Stanford University has an Advanced Eye Interpretation Project, and the following quote is from their web site. Our patented work on inferring mental states from eye-movement patterns allows us to better describe what users are doing. This ongoing research moves beyond merely asking where a person's eyes are focused, but aims to infer high-level behaviors from observing various patterns of eye-movement. Interesting results become apparent when behaviors such as "reading" and "searching" are analyzed as users interact with dynamic, complex applications. What do people do when they read on-line news? How much do they read on which providers? The Stanford/Poynter Eyetrack2000 Project is analyzing typical users' eye-movements and surfing behavior as they read on-line news to answer these (and many more) questions. Here is a Scientific American article describing how researchers can predict a rhesus monkey's arm movements from brain recordings a fraction of a second before the monkey's muscles move. This Wired article from 1993, "The Desire to Be Wired," is about neural interfacing. 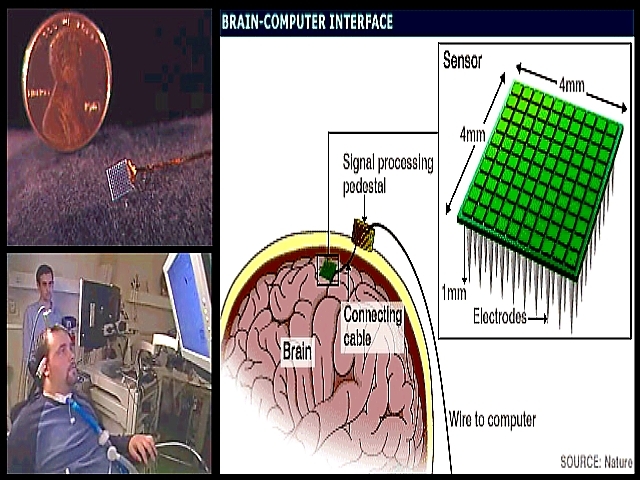 Among other topics, it discusses independent, do-it-yourself researchers of brain interfacing devices. The following excerpt describes an experiment in EEG transference. It is not sufficiently documented in the article to be taken as a scientific study, but is nonetheless interesting. David Cole of the non-profit group AquaThought is another independent researcher willing to explore the inside of his own cranium. Over the years, he's been working on several schemes to transfer EEG patterns from one person's brain to another. The patterns of recorded brain waves from the source subject are amplified many thousands of times and then transferred to a target subject (in this case, Cole himself). The first tests on this device, dubbed the Montage Amplifier, were done using conventional EEG electrodes placed on the scalp. The lab notes from one of the first sessions with the Amplifier report that the target (Cole) experienced visual effects, including a "hot spot" in the very location where the source subject's eyes were being illuminated with a flashlight. Cole experienced a general state of "nervousness, alarm, agitation, and flushed face" during the procedure. The results of these initial experiments made Cole skittish about attempting others using electrical stimulation. He has since done several sessions using deep magnetic stimulation via mounted solenoids built from conventional iron nails wrapped with 22-gauge wire. "The results are not as dramatic, but they are consistent enough to warrant more study," he says. This cyberpunk site, for example, contains related information. See also the page on implants.